I’m just about to pack up my stuff and head home. For the last four days I’ve been working at the wonderful Gladstone’s Library, a residential library based in Hawarden North Wales. They kindly gave me a residential fellowship this year which has enabled me to read and collect my thoughts on material religion. I have not thought about this topic since Tim Jones and I ran our conference on ‘Material Religion in Britain and her Worlds’ two years ago. I’ve used my time at Gladstone’s to think about the introduction to our edited collection. Having spent the last couple of days reading about material culture and the sacred, I can now survey my desk and think about my research processes. 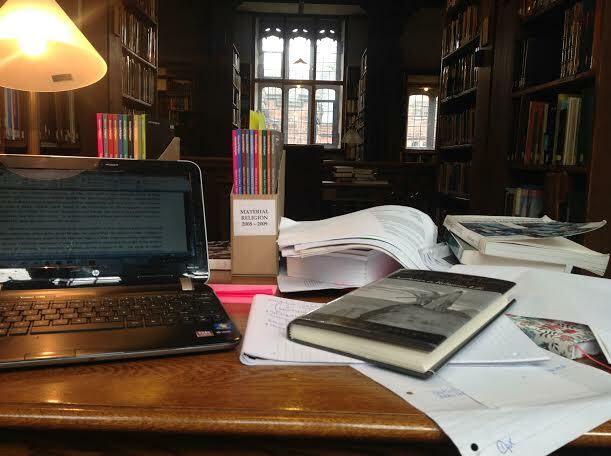 Gladstone’s Library has reminded me that I prefer my research process to be filled with stuff; books, scraps of paper, photocopies of articles and book chapters, notes and coloured post-notes. I love the messiness of research. I adore the piles of papers that I have precariously built. The stacks of books that show you are in the process of doing serious research. More importantly my desk in the library’s alcove has reaffirmed to me that I am a researcher and not just a teacher or administrator. To outside eyes my research papers and books are probably untidy, which need ordering and filed away. My cleaner at home always straightens my papers. My husband despairs and usually closes my office door. My life is always filled with books and papers whether I’m researching or preparing lectures. Everyone’s research experiences are difference. My mess is probably reflective of my dyslexia. To understand and process knowledge I need to see, touch and smell what I am doing. I have to become a sensory researcher. Reading and writing notes on a computer for me is flat. There is no depth to the words on the screen. Typing for me rarely creates sensory experiences that enable me to remember what I’ve done. Rather words need to be highlighted by my whole hand not just with a fingertip. They need to be read on paper and not just ‘cut and pasted’ into a word document (which I might one day return too). As a consequence I don’t hold the book in sacred regard. I write in them, I highlight sentences, I stroke the paper, I smell them. Touching the book encourages me to remember the research experience. This isn’t to dismiss digital humanities. Databases are great. OA will make our research more available in electronic forms. But research is always more than words. As my reading on material religion reminds me, things and our sensory engagements with them matter. My research needs to have a physicality that evokes all the senses. As a fellow ‘Scruffy’ (whose cat adores pawing piles of paper while in a kind of trance), I can only applaud this post. All scruffies are different; their mess is personal. Every messy desk is unique, all clear ones are the same (well, to borrow from Wittgenstein they are ‘more’ the same).